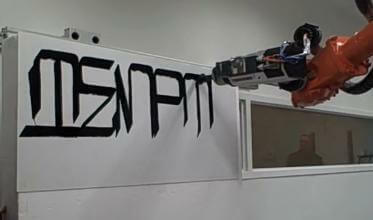 Carnegie Mellon students got this ABB robot to tag a wall using the new Graffiti Markup Language. Dang-blasted kids with their music, and their clothes, and no respect for authority. They’ve gone and corrupted law-abiding robots, teaching them how to graffiti! Students at Carnegie Mellon University’s new Fabrication Lab programmed an ABB robot (4400 model) to graffiti using a two inch black marker. The ‘tags’ were downloaded from #000000book, a website where graffiti artists can record digital copies of their signature work. The CM students then converted those digital records into motion controls for the robot and – bam! – instant robot delinquent. Check out the video after the break to see the ‘Robotagger’ robot mark its turf. The project was the brainchild of Golan Levin who gives more details in his blog. The graffiti tags you see in the following video were developed by an artist with Lou Gehrig’s disease named Tony Quan (aka Tempt). They were created using Eye Writer, an eye tracking software. So the Robotagger may be the arm, but the creative spark is still human. Graffiti artists and technology hackers would seem to have a lot in common. #000000book is just one way in which its creators, the Free Art & Technology Lab (F.A.T,), have tried to bring open source to street artists. They’re also the brains behind Eye Writer and many other projects. Here we have a synergistic hybridization of artists, programmers, and hackers bringing make culture into the world of graffiti. I really enjoyed the following video which explains the scope of their GML (graffiti markup language) format for recording graffiti tags. Did you see the building-sized graffiti light show at 0:33? That’s the work of the Graffiti Research Lab, whose project uses a laser to temporarily tag a building. We first heard about it from a commenter on our story about building-sized projectors. Its’ a cool concept. And so is GML, #000000book and the Carnegie Mellon graffiti bot. All of these projects demonstrate a technical know how and love of street art that makes me very proud of the upcoming generation. Ingenuity, creativity, and hard work aren’t dead. The traditional “counter-culture” has evolved into something new with the help of digital media. Just think about all the awesome open source and do it yourself projects we’ve seen in the last year: telepresence robots, computerized clothing, the muralizer, and many others. These aren’t conventional art forms by any means, but they’re really cool and a good sign of what my be coming in the near future.